The Farm Belt helped cement President Trump’s historic electoral triumph over Hillary Clinton. But even before Trump started his trade war with China nearly one year ago, Trump’s protectionist bent has added to the collective woes of farmers, who were already struggling with low prices for corn, soy beans and other agricultural commodities. …driven by a lasting slump in agricultural commodity prices due in large part to the rise of rival producers like Brazil and Russia. And Trump’s trade wars – not just with China, but more broadly – aren’t helping. Because of this, the level of farm debt is approaching levels last seen in the 1980s. The stress on American farmers is also affecting agribusinesses giants like Archer Daniels Midland, Bunge and Cargill, who are feeling the heat even as lower crop prices translate into less-expensive raw materials for the commodity buyers. What’s worse is that even after working side jobs to try and make ends meet, some farmers are still winding up more than $1 million in debt. Mr. Duensing has managed to keep farming, hiring himself out to plant crops for other farmers for extra income and borrowing from an investment group at an interest rate twice as high as offered by traditional lenders. Despite selling some land and equipment, Mr. Duensing remains more than $1 million in debt. Even more shocking than the number of bankruptcies, the number of farms that continue to operate while losing money has risen to more than half of all farms, even as the level of productivity has never been higher. Agricultural lenders, bankruptcy attorneys and farm advisers warn further bankruptcies are in the offing as more farmers shed assets and get deeper in debt, and banks deny the funds needed to plant a crop this spring. “We are seeing producers who are running out of options,” said Tim Koch, senior vice president at Omaha, Neb.-based Farm Credit Services of America, which lends to farmers and ranchers in Iowa, Nebraska, South Dakota and Wyoming. Perhaps the only silver lining – if you can even call it that – is that bankruptcy lawyers in states where farms are prevalent are doing their best business in years. Mounting stress in the Farm Belt has meant big, if somber, business for the region’s bankruptcy attorneys. In Wichita, Kan., the firm of bankruptcy attorney David Prelle Eron filed 10 farm bankruptcies in 2018, the most it has ever handled in one year. Wade Pittman, a bankruptcy attorney based in Madison, Wis., said his firm filed about 20 farm bankruptcies last year, ahead of past years, and he said he expects the numbers to continue to rise as milk prices remain stagnant. Joe Peiffer, a Cedar Rapids, Iowa-based attorney, said his office is the busiest—and most profitable—it has ever been. Just before Christmas, he sent letters to eight farmers declining to represent them because he didn’t have sufficient staff to handle their cases promptly. He is doubling his office space and interviewing new attorneys to join the firm. One factor driving bankruptcies is tighter lending standards, said Mr. Peiffer, including at agricultural banks, which are under pressure from regulators to exercise greater caution over their farm-loan portfolios. “I’m dealing with people on century farms who may be losing them,” said Mr. Peiffer, whose own father sold his farm in the late 1980s. One anecdote featured in the story recalls the rash of suicides among NYC cab drivers, who have struggled to pay the hefty loans attached to their taxi medallions thanks to the rise of Uber, Lyft and other ride sharing apps. Darrell Crapp, the fifth-generation owner of a hog and cattle farm in Lancaster, Wis., returned to his home one day with a queasy feeling in his stomach, only to find his wife unconscious on their bathroom floor. She had swallowed a handful of pills. She survived, but Crapp attributed the incident to financial stressors as their farm teetered on the brink of bankruptcy. It was a Sunday in April 2017 when a queasy feeling in Darrell Crapp’s stomach sent him rushing home. He found his wife, Diana, lying crumpled on the floor of their Lancaster, Wis., bathroom. She had swallowed a handful of pills. Overwhelmed with debt and with little prospect of turning a profit that year, the Crapps knew BMO Harris Bank NA wouldn’t lend them money to plant. The bank had frozen the farm’s checking account. Mrs. Crapp managed the fifth-generation corn, cattle and hog farm’s books. She had stayed up nights drafting dozens of budgets to try to stave off disaster, including 30-day, 60-day and 90-day budgets. “It was too much for her,” Mr. Crapp, 63, said of his wife, who survived the incident. Crapp Farms filed for chapter 11 bankruptcy the next month, with a total debt of $36 million. After filing for bankruptcy, the last of Crapp’s land, a 197-acre patch that was homesteaded by his ancestors in the 1860s, will be auctioned off in the near future. And after all that, Crapp may still need to declare Chapter 12 bankruptcy, a personal bankruptcy provision available to farmers and fishermen, to wipe his remaining debts. Unfortunately for American farmers hoping to reclaim the market share they’ve lost during the trade war with China, even if Trump can strike a trade deal with the Chinese that mandates purchases of US agricultural products – which the Chinese have already pledged to do – there’s still another wrinkle: Japan recently signed a revamped version of the TPP that will offer preferential treatment to Australia, New Zealand and other rivals to American farmers, potentially sealing off another market from US agricultural products. This entry was posted in Agriculture, Banking, Economy and tagged Farming on February 8, 2019 by Bone Fish. Production of meat and seafood around the world will double to 1.2 trillion pounds by 2050. Our planet cannot afford to supply the water, fuel, pesticides, and fertilizer that industrialized animal production requires. It can’t afford the polluted water or the biodiversity loss. It can’t afford the moral inconsistencies. And they think it’s unlikely that people will consistently choose plant-based alternatives over chicken, beef, pork, and seafood. The world needs a solution to these realities. With plants providing nutrients for animal cells to grow, they believe they can produce clean meat and seafood that is over 10x more efficient than conventional meat production. All this without confining or slaughtering a single animal and with a fraction of the greenhouse gas emissions and water use. Their approach will claim to be transparent and unquestionably safe, free of antibiotics and have a much lower risk of food borne illness. The right choice will be obvious. This entry was posted in Agriculture and tagged Clean Meat, Cultured Meat, In Vitro Meat, Tissue Engineering on March 22, 2018 by Bone Fish. (Reuters) – Amazon.com Inc (AMZN.O) said it will cut prices on a range of popular goods as it completes its acquisition of Whole Foods Market Inc (WFM.O), sending shares of rival grocers tumbling on fears that brutal market share battles will intensify. Amazon’s $13.7 billion purchase of Whole Foods, which will be completed on Monday, has been hanging over a brick-and-mortar retail sector unsure of how to respond to the world’s biggest online retailer. Shares of Kroger Co (KR.N), the biggest U.S. supermarket operator, closed down 8 percent, while Wal-Mart Stores Inc (WMT.N), the biggest U.S. food seller, closed down 2 percent. Amazon also said it will start selling Whole Foods brand products on its website, a move that sent down shares of packaged food sellers including Kellogg Co (K.N). The S&P 500 Food Retail index closed down almost 5 percent as more than $10 billion was wiped off the market value of big food sellers. Amazon said members of its $99-per-year Prime shopping club would eventually be rolled into Whole Foods’ customer rewards program and be eligible for special offers and discounts. “There was never any doubt that Amazon would lower prices, and even offer further discounts in-store to Prime members,” said Baird Equity Research analyst Colin Sebastian. Amazon said that starting on Monday it will cut prices on organic grocery staples such as bananas, avocados, brown eggs, farmed salmon and tilapia, baby kale and lettuce, some apples, butter and other products. Lowering prices could stem defections by price-sensitive Whole Foods shoppers, and help the grocer shed its “Whole Paycheck” reputation for high prices that are generally 15 to 25 percent above rivals. It could also bring in new consumers who can then be urged to shop for food and other products online. The planned price cuts would have been a tough sell to Whole Foods’ investors, who had grown used to fat profits from the upscale chain, but are more in line with Amazon’s broader strategy of sacrificing short-term profit for long-term market dominance. Amazon’s willingness to take lower profit margins ups the ante in the increasingly costly grocery price war. “In some cases grocery retailers have had to invest between $500 million to $1 billion in order to reduce prices to a level that retained customers and resulted in a net increase in customers,” said Brittain Ladd, who until earlier this year was a senior manager working to globally roll out AmazonFresh, Amazon’s grocery delivery service. Adding Whole Foods benefits should help Amazon attract more shoppers to its successful Prime scheme, which features two-day shipping for eligible purchases and unlimited streaming of movies and TV shows. Amazon has more than 60 million Prime members, according to analyst estimates. Whole Foods has rolled out a loyalty program at its smaller, lower-priced 365 by Whole Foods chain, which offers members 10 percent off more than 100 items in the stores. The program is still being tested in the main Whole Foods chain. Beyond that, some Whole Foods stores will get Amazon Lockers, where customers can receive online orders and make returns. John Mackey will remain chief executive of Whole Foods and the company will operate as a subsidiary and continue to be headquartered in Austin, Texas, the companies said on Thursday. This entry was posted in Agriculture and tagged Amazon, Amazon Fresh, Food, Whole Foods on August 28, 2017 by Bone Fish. Farmer Mac, the Fannie Mae of agriculture, trades at 1 times book and 7 times earnings despite delivering sustainable 15-20% ROEs. Organizational improvements are finally enabling Farmer Mac to rapidly gain share; penetration remains low, so the growth runway is long. Investors drew the wrong lesson from Fannie Mae’s failure. GSE privileges enable super profits from mundane activities. Fannie failed because it strayed from its core business. During the late 1980s, plunging agricultural prices threatened the solvency of the Farm Credit System (FCS), a problem congress tried to address in the usual manner. They bailed it out. Non-FCS banks weren’t happy about that since they thought the FCS’ (“unfair”) advantages were the primary cause of the boom-bust cycle that required the bailout in the first place. So congress chartered Farmer Mac (NYSE:AGM) to help level the playing field for banks by providing a secondary market for their loans. 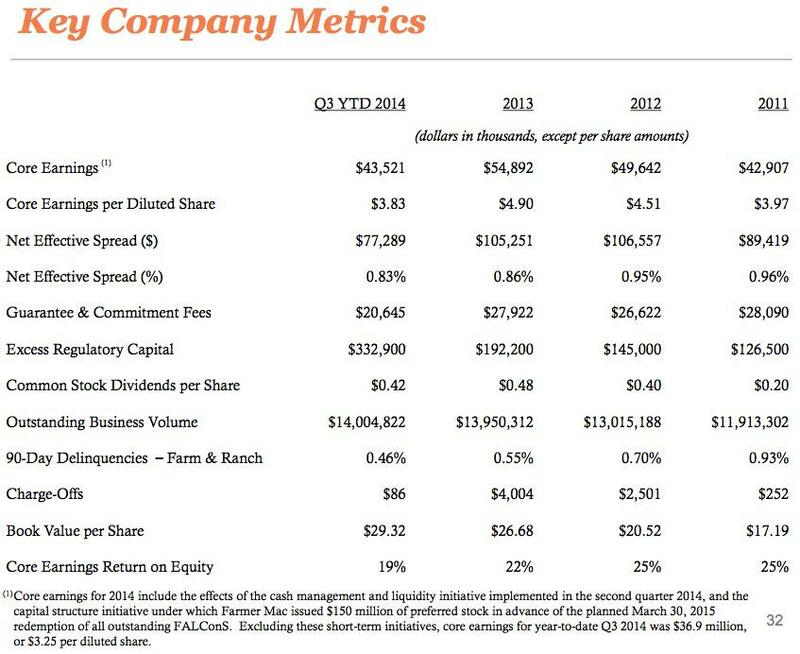 The FCS is old and big; it was chartered by the Feds in 1916 and it supplies ~40% of US farm credit. (All you really need to know about the FCS is that its institutions have lower long-term funding costs than deposit fueled banks; and they’re supposed to restrict their lending to agricultural and certain rural development situations.) It’s hierarchically structured and cooperatively owned. 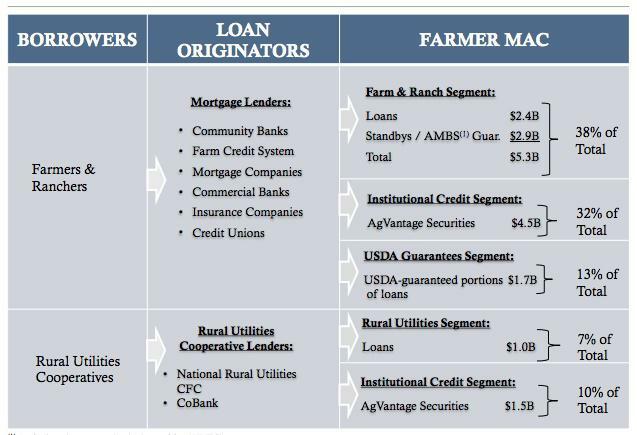 Agricultural operators borrow from and own stock in its retail lenders (Farm Credit Associations, FCAs, of which there are presently ~80); FCAs borrow from and own stock in wholesale lenders (Farm Credit Banks, FCBs, 4); who borrow from and own stock in the FCS Funding Corp. which taps capital markets; these proceeds then flow down through wholesalers to retailers to farmers. The FCS Insurance Corp. which has a $10b line of credit with Treasury guarantees FCS bond issuances. The system can borrow longer and cheaper than any purely private sector entities of lesser quality than, say, ExxonMobil, which enables the usual GSE competitive edge (like Fannie Mae, (OTCQB:FNMA) at funding long-term fixed rate assets. The system is exempt from taxes on certain types of lending. For these privileges the FCS is constrained to lend to underserved rural America, which it likes to define as widely as possible (a wholesaler recently lent to Verizon Wireless!). Though wholesale FCS institutions are in some ways similar to AGM they’re not allowed the leverage necessary to be an effective maker of secondary markets; and they can’t deal with non-FCS lenders (commercial banks). (See Bert Ely’s articles on the FCS for an insightful banker side point of view.) Anyway, back to the chronology. Ag Banks, by which I mean non-FCS commercial banks with agriculturally concentrated portfolios, always hated the FCS for their privileges. So you can imagine their displeasure with the 1987 FCS bailout. Farmer Mac was the bone congress threw to banks to apologize for the bailout of their rival. If a bank couldn’t offer a borrower as low a long-term fixed rate as a “predatory” FCS lender, they could still originate the loan and keep the customer by selling it to AGM. The rate ought to be FCS competitive since AGM, with their $1.5b emergency Treasury line of credit, can borrow cheap and long like the other GSEs. And banks could still make maybe 0.7% risk-free for servicing the sold loan. That was the idea at least, but it’s taken some time for things to work that way. AGM, which was chartered in 1987 and operationalized in 1989, had nothing to do with the ag recovery that was gaining steam in 1995. They’d executed less than $1b in securitizations (transactions where purchased loans are pooled, made into a bond, guaranteed by AGM and sold) to that point, a trivial fraction of their potential addressable market. When AGM’s charter was initially being considered experts had expected $2-3b in securitizations per year. In 1995 having never turned a profit and with just 43%, or $12m, of their original capital remaining, AGM appealed to congress to liberalize their straitjacket of a charter. They got what they asked for in the form of the 1996 Ag Reform Act. The first key change was the elimination of the skin in the game rule that required originators to hold loan residuals, the first 10% loss position on loans sold. That provision in practice meant sellers retained all the credit risk. So selling banks had been getting neither relief of credit risk nor required capital. Secondly, the Act let AGM bypass loan poolers (insurers and big banks) to buy loans directly from originators. It’s unclear to me why direct purchase was ever forbidden since an extra pooling intermediary adds cost and complexity, and makes both AGM and ag banks dependent on the efforts and interests of third parties. But anyway, the 1996 Act transformed AGM. The removal of these two key restrictions let them generate the business volume necessary to immediately turn and remain profitable. Business volume and profits grew rapidly from 1996 through 2003. Though the majority of the growth, especially between 2000 and 2003, was generated by transactions between FCS lenders and Farmer Mac! By 2003 the popularity of LTSPCs meant that the FCS was doing three times more business with AGM than banks; an irony and an outrage for AGM’s initial supporters! In 2003 the Independent Community Bankers Association (ICBA) told congress that AGM wasn’t doing a good job for its constituents. You see, there are 1,500 ag banks in the US and yet in any given year between the late 1990s and 2010 only 40-80 of them transacted with AGM. Of those, the top 10 would often comprise 90% of their volume. So most years AGM truly mattered to less than 1% of US ag banks! In contrast, ~30 of the 80 FCS associations bought LTSPCs each year. This is not how Farmer Mac was supposed to operate. The asymmetry between FCS and bank participation was caused by two things. First, ag banks tend to be smaller than FCS lenders, and AGM’s programs were too clunky and time consuming for small lenders to participate in. Second, AGM was less rigid in the loan structures they were willing to guarantee with LTSPCs than the ones they’d purchase. Flash forward. After a decade of little quantifiable progress in expanding breadth, the number of banks who sold loans to AGM in 2013 nearly tripled to 220 from 80 in 2010; eligible and approved sellers tripled too, to more than 600. Here is the path of the dollar volume of loan purchases between 2008 and 2013: $196m, $195, $382, $495, $570, $825. Most tellingly, the top ten 2013 loan sellers comprised just 53% of AGM’s record $825m in 2013 volume. Breadth of participation is exploding. Right now. First, whereas the ICBA said underwriting took weeks or months back in 2003, AGM now targets two days. The 2005 launch of their web-based underwriting system (AgPower LOS), and its subsequent iterative improvement, deserves much of the credit. Third, was their outreach. AGM formed alliances with the American Banking Association (ABA) in 2005, and ICBA in 2009 featuring, among other things, pricing discounts for members and a commitment to get in the field to educate and learn from ag banks. This doesn’t sound important, but I gather that sleepy $25m rural banks aren’t the most proactive institutions, which in some ways is a good thing when I think about Countrywide and Indymac. Anyway. In 2010, a ripe AGM collided with an amenable macro environment, with borrowers scrambling to refinance into long-term fixed rate loans, and their volume exploded. Today 75% of new loan and LTSPC transaction volume comes from non-FCS bank lenders, which is the way it always should have and would have been if AGM’s organization weren’t so immature until recently. Let me summarize before I move on. AGM’s charter restricted their growth before 1996; its liberalization enabled rapid (but narrowly fueled) growth and increasing profitability through 2003. With their addressable FCS market addressed, growth then stalled due to organizational problems that hindered their ability to serve non-FCS banks, which is ironic because it’s these entities who their funding capabilities complement best. More efficient underwriting, smarter and more flexible pricing, and successful outreach programs prepared the ground that spurred re-ignition of gradual growth in 2008-2010 and explosive growth post-2010 when the macro environment turned favorable. AGM has been posting 15-20% ROEs since 2010 and looks poised to do similarly in the future, as they continue to penetrate a huge non-FCS addressable market. An institution’s structure determines what it ought to do. Farmer Mac can borrow cheap and long; and it’s allowed ~3 times the leverage of an ordinary bank. Therefore they are uniquely capable of transforming low credit risk, low fixed rate assets into substantial ROEs. And since it’s easy to underwrite prime assets originated by third parties they can run the business with 1/10th the overhead of an ordinary bank, amplifying their competitiveness in their niches. Basic ag loans and LTSPCs, the stuff I’ve talked about so far, are actually the riskiest and most profitable bucket of assets AGM is exposed to. The other half of their program volume (assets + off-balance sheet guarantees) contains virtually no credit risk. 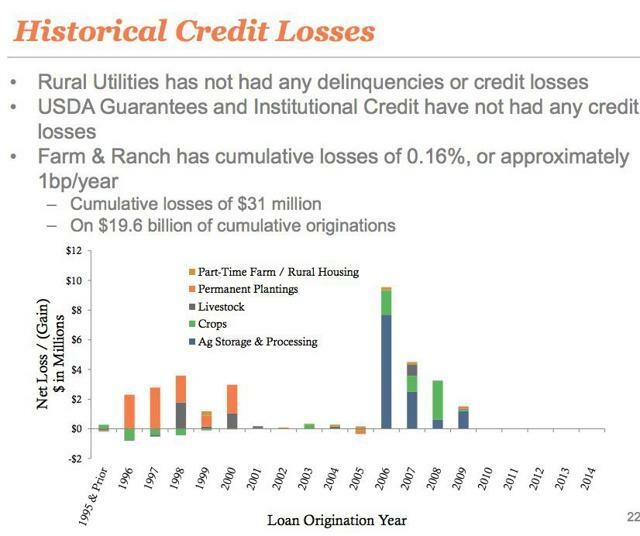 For example, 13% of assets are USDA guaranteed rural loans backed by the full faith and credit of the US government. Another 32% are general obligation bonds issued by high quality credits like Metlife, all of which are 100-111% collateralized by eligible ag loans. Last, 17% of volume is a combination of direct and AgVantage (collateralized bond) exposure to Rural Utilities loans, which are highly regulated entities that enjoy the safety of cost-plus pricing. Their charter was expanded to include this business in 2008. Spreads are low in these other business lines, but a 0.6% match-funded spread (locked-in by matched duration debt issuance) with no credit risk, requiring little labor to underwrite, levered 25-30 times (including preferred equity; 40 times on common equity), is a highly profitable risk adjusted deal. GSE charter privileges let you earn big profits in mundane ways. Getting back to the “Farm & Ranch Segment,” which is how AGM collectively refers to their portfolioed ag loans and off-balance sheet guarantees: I’d mentioned that these are their riskiest assets. How risky? Not very. Cumulative losses are 1 bp per year; that is $1 on each $10,000 of loans. Total historical losses of $31m equate to about $2.00 per share fully-taxed. AGM’s actual book value is ~$30; it’d be $32 if they’d never lost a penny since 1989. Excluding a 2006 foray into ethanol facilities, which has been aborted, historical losses are half as large, 1/2 bp per year. Credit losses are historically immaterial. And by every metric credit is more pristine than ever. The weighted average loan-to-value ratio is presently 44% based on originally appraised real estate values; factoring in land price appreciation, the market LTV is surely below 40%. That sort of collateral with sub 0.5% delinquency rates means minimal credit risk. Fannie Mae beat the market by a factor of 7.5 between 1984 and 1999. Digest that. GSE privileges are valuable if you don’t venture from the core business model, which is pretty simple: don’t take substantial credit risk. Ever. Fannie imploded because, in an effort to gain back lost market share and to prove their social worth, they ventured into subprime and alt-a exposures between 2004-2006. Their prime book of business did just fine during this period. AGM is priced at 1 times their ~$30 book value; and ~7 times their ~$4-4.40 EPS run-rate. With the organization and processes (finally) in place to play an ever increasing role in non-FCS agricultural/rural lending, I think they can grow program volume and earnings by 10-15% per year; and that they can maintain ROE in a 13-20% range indefinitely, at manageable risk. Obviously the market disagrees. What is AGM worth? Play around with how book value grows over long horizons at a 15%+ ROE; and with expansion in P/Book from a starting value of 1.0 to an ending value of 2.0, or 3.0. A 15% ROE for five years and an ending P/Book of 2.0 gives us a target of $120, 300% upside. Its corporate governance is awkward to say the least. Us “C” class shareholders can’t vote. The A and B shares are respectively restricted to non-FCS financial institutions, and FCS ones, who each elect 5 board reps. The remaining 5 reps of the 15 member board are presidential appointees who, I’d assume, are there to make sure everyone plays nice. As AGM’s role in banking grows at the expense of the FCS board, which seems to be functioning fine presently, may become more interesting. Further, AGM and the FCS share a common regulator, the Farm Credit Agency (FCA). If you ask bankers they’ll tell you the FCA is captured by the FCS. That’s not clear to me but do your own diligence. Secondly, though AGM’s assets appear superbly safe, their leverage means the error margin is small. For example, AGM may not have survived 2008 if not for a capital injection from a group of concerned counterparties. The problems stemmed not at all from the core business; their liquidity portfolio contained Fannie and Lehman preferred stock! They’ve since tightened their investment standards considerably, but the Fannie/Lehman writedowns were life threatening only because AGM is so levered. Relatedly, though AGM’s interest rate risk management has dealt well with the stress of the last 7 years, and their duration gap never is more than a few months, it’s hard to tell what would happen if rates spiked 3-5% quickly. Lastly, with the sector so healthy and liquid, there’s the risk that AGM won’t be needed. Back in 2003-2004, AGM blamed its shrinking program volume on just that. But in retrospect, I think we see that the problems were internal, not macroeconomic, because today, in a similarly healthy environment, we see their program volume and breadth marking new records quarterly. Michael Burry allocates his attention to investments that inspire in investors a reaction of superficial disgust; “ick!”. AGM does that. 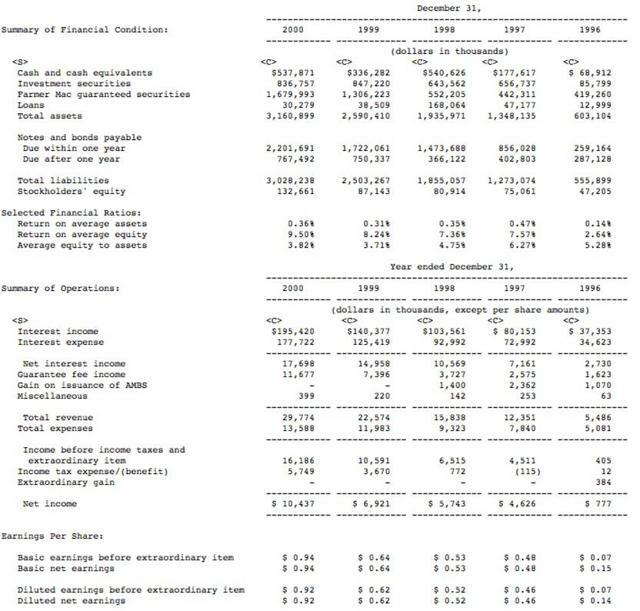 People see AGM and think Fannie, Leverage, whoa what happened in 2008 and what heck is an LTSPC? (Like this Seeking Alpha contributor does here.) Sure, they’ve been delivering ~18% ROEs in recent years, but that probably just reflects the blow-up risk they’re taking. All these impressions are wrong in a nuanced way. AGM’s leverage has proven appropriate, maybe even inadequate, relative to the volatility of their core assets. Fannie was one of the best performing stocks on earth for 15 years; and their implosion was the product of stupidly straying into credit markets they never belonged in during the biggest housing bubble ever. And AGM’s problems in 2008 reflected specific, fixable mistakes in their liquidity portfolio, not a fundamental problem with the core business. With a broader view we see a company that is constantly, concretely, and quantifiably improving its ability to translate its unique privileges into an abnormally high and steady return on equity. And those of us prone to long term, optimistic thinking can’t help but analogize to Fannie’s millionaire making run between 1984 and 1999. I could be wrong. But I don’t think many folks have put the time in to find out. This entry was posted in Agriculture, Uncategorized and tagged Farm Credit System, Farmer Mac on February 6, 2015 by Bone Fish.